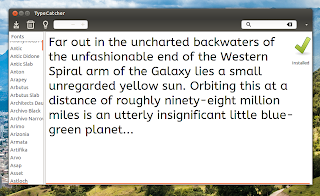 TypeCatcher is an application that allows to easily browse, search, download and install fonts from the Google Web Fonts collection, which includes hundreds of open source fonts. "Google Fonts makes it quick and easy for everyone to use web fonts, including professional designers and developers. We believe that everyone should be able to bring quality typography to their web pages and applications". 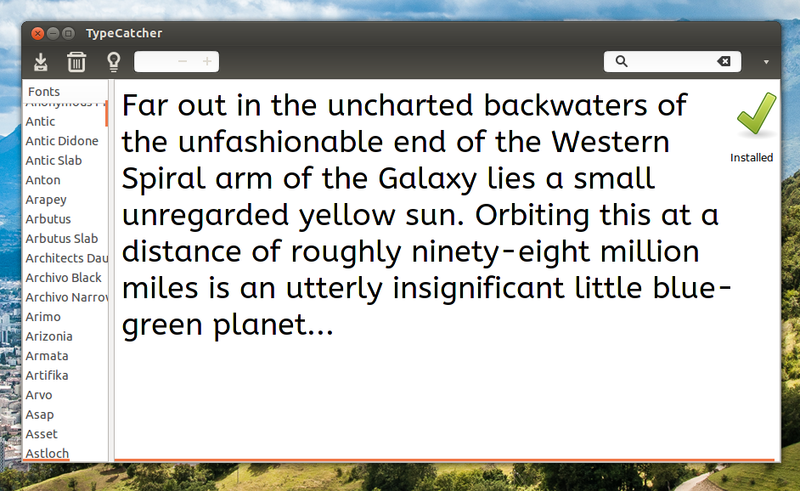 for more info about a font, it can open its webpage in your default web browser. As you can see, the application is pretty simple but it's also very useful since Google doesn't have a direct download link on its Fonts page: clicking the download link offers to "Sync Google fonts to your desktop using SkyFonts", an application somewhat similar to TypeCatcher but which is only available for Windows and Mac (update: another way of downloading some fonts is to add them to your "collection" and then download your whole collection from Google Fonts). The application doesn't support downloading and installing all the fonts at once but for this, you can use a script we've posted a while back. Arch Linux users can install TypeCatcher from AUR. Grab the source code or report any bugs you may find @ Launchpad.